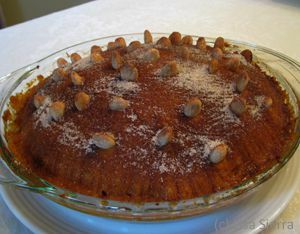 Arnadi de Calabaza - Easy Spanish Pumpkin Dessert. (c) 2013 Lisa Sierra Licensed to About.com Inc.
Arnadi de calabaza, also called Carabassa Santa is from the region of Valencia, Spain. It is typically eaten on Holy Thursday in two small areas called La Costera and La Ribera Alta about 35 km south of the capital city of Valencia. Arnadi would traditionally be prepared by cleaning and boiling pumpkin or another type of squash, however canned pumpkin is now readily available in the supermarket, which speeds up preparation. Like all traditional recipes, every cook has their favorite. Some prepare Arnadi de calabaza with only pumpkin, while others use a combination of pumpkin and sweet potatoes. This version uses both canned yams and pumpkin. If using fresh pumpkin: Cut pumpkin open and scrape off all stringy fibers. Remove seeds. Cut off rind using a sharp knife. Cut pumpkin into smaller pieces (1-inch to 2-inch chunks). Put in a large pot and add 1-2 cups water. Cover tightly and simmer 20 minutes, or until flesh is soft. Drain, peel and mash with a potato masher. Beat the eggs lightly. Drain syrup from canned yams. Mash yams with a potato masher, and place in a large sauce pan. Add pumpkin puree, eggs, oil and ground almonds. Turn on medium low heat and cook, stirring continuously for 5-10 minutes. Add lemon zest and cinnamon and cook for 5 more minutes. Be sure to stir, so pumpkin mixture does not burn. If using fresh pumpkin or squash: Cook until liquid has evaporated, so filling is not soupy. Fill a cake pan or shallow glass baking dish with the mixture, forming a dome shape. Heat the oven to 360F degrees. Prepare the almonds and pine nuts for decoration. Put oil in a large heavy bottom frying pan and heat. Fry the almonds in the oil (and optionally the ground pepper) until golden and remove. Drain on paper towel. Fry and drain the pine nuts. Brush the pumpkin mixture with the oil used to fry the almonds. Decorate the dome by placing the almonds half way into the pumpkin forming lines, pointed end down (see photo). Then, fill in between with the pine nuts if using. Dust with powdered or granulated sugar and bake in center rack for 20 minutes, or until the top is golden.